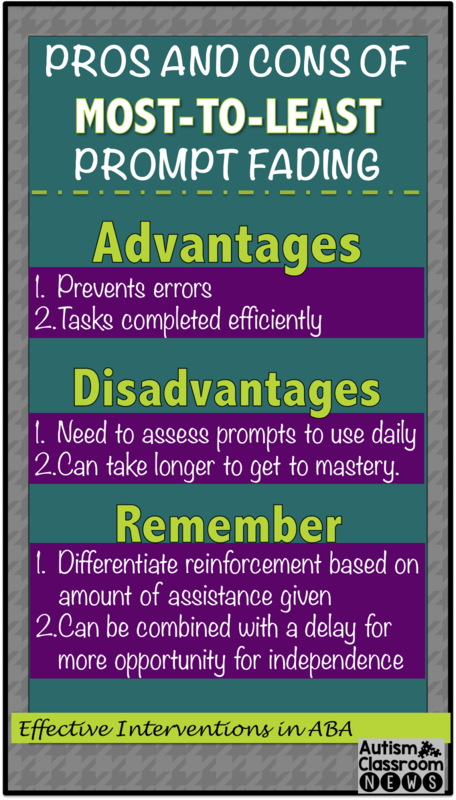 Continuing the series on the series on Effective ABA Instructional Interventions, the next prompt fading strategy to address is Most-to-Least prompt fading. Like least-to-most fading that I talked about in the last post in the series, this fading procedure involves using the hierarchy of prompt types to fade them out. 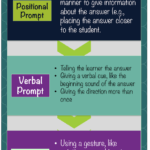 However, as it is named, you start with the most intrusive prompt and gradually reduce the intrusiveness of the prompts until the student is independent. What is Most-to-Least (MTL) Prompt Fading? In this fading strategy, you use the most intrusive type of prompt and as the student is successful with that prompt, you drop to the next most intrusive. So, let’s say I am teaching Sally to identify pictures of vocabulary words. When I first introduce the task, I give her the direction (i.e., find block) and immediately physically prompt her to touch the picture of the block. I use the physical prompt for a set period of time (through the first or first and second teaching session) and then I would use a partial physical prompt as soon as I give the direction. Gradually I would work my way down the hierarchy until the student was independent. 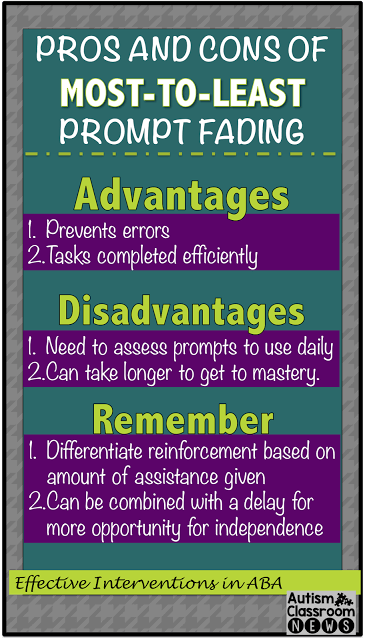 Alternatively, I could also assess the prompting levels each day to determine how intrusive my prompt needs to be. In that case, I would conduct a probe at the beginning of each teaching session. A probe would be a set of trials where I present all the targets one at a time and use least to most prompting to see what the least intrusive prompt the student needed to give correct responses. Typically this is done without reinforcement and it’s brief with no more than 1 presentation of each target. It’s not a teaching part of the session; it’s an assessment. I then record the type of prompt that was needed and use the most intrusive prompt that was needed in that probe for the teaching/instructional session. This allows me to possibly move more quickly up to more independence based on the rate of the student’s learning. One of main advantages of most to least (MTL) prompting over least to most (LTM) prompting is that whereas LTM can lead to more errors, MTL prompting reduces errors. 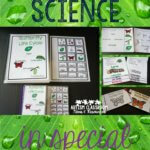 This prevents the learner from incorporating errors into their learning. 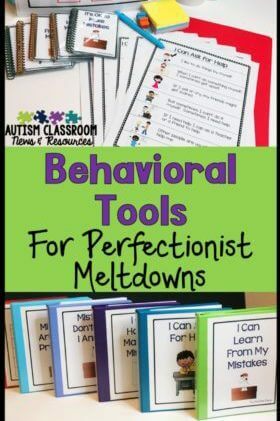 MTL is often used with errorless learning, which I will review later in the series, as a way to set the student up for success, increasing reinforcement, and reducing errors that have to untaught. MTL is also more efficient in completing tasks than LTM because you don’t have to have the waiting time between each prompt level. You start with the most intrusive prompt so the student completes each task more quickly without having that wait time we have when we try to use the least intrusive prompt first. In order to really move forward with MTL prompting, you need to know how much you can fade at each session. 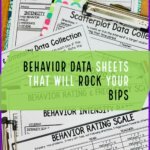 Consequently, you need to do regular assessments, or probes, to see what type of prompting a student is likely to need as time goes on. This means you have to do a probe at the start of each session to be most effective, which of course takes some time. It might also be problematic if you have a student with a limited attention span. You may end up losing some instructional time by doing the assessment. MTL can also take a long time to get to independence because we may actually be prompting too much in an effort to prevent the errors. As with LTM (and any type of prompt fading), you need to make sure you are using reinforcement differentially based on independence. More independence = more reinforcement. Less independence should result in lower levels of reinforcement (e.g., just praise but no concrete reinforcer). Making sure your using reinforcement effectively is critical to the success–otherwise there is no reinforcement for increasing independence. Finally, there is some research that MTL prompting can be made more efficient by adding in a time delay (Libby, Weiss, Bancroft, & Ahearn, 2008). Essentially you add in a set delay before you provide that most intrusive prompt. This gives the student the opportunity to respond independently before you prompt. So, to sum up, MTL with a delay is often a good default choice that gives the student an opportunity to be as independent as possible while making fewer errors. However, some learners still perform better with LTM or other fading possibilities. These two prompting strategies also work well with motor skills, but are more difficult to use with verbal skills because the prompts are harder to fade. I’ll talk more about that in the next post in the series. Research has indicated that there are individual differences in responding to prompting, so you have to use your data to determine what is most effective (Libby et al., 2008) and the Libby et al. article (found HERE) is a good review (at the end of the study) of guidelines to use to decide if you are looking for more information. I am looking forward to what you have planned!!! Your ideas and products are simply fantastic! Happy summer to you! Thanks Sharon! Now that I have some time I can start to put some new ideas in place!